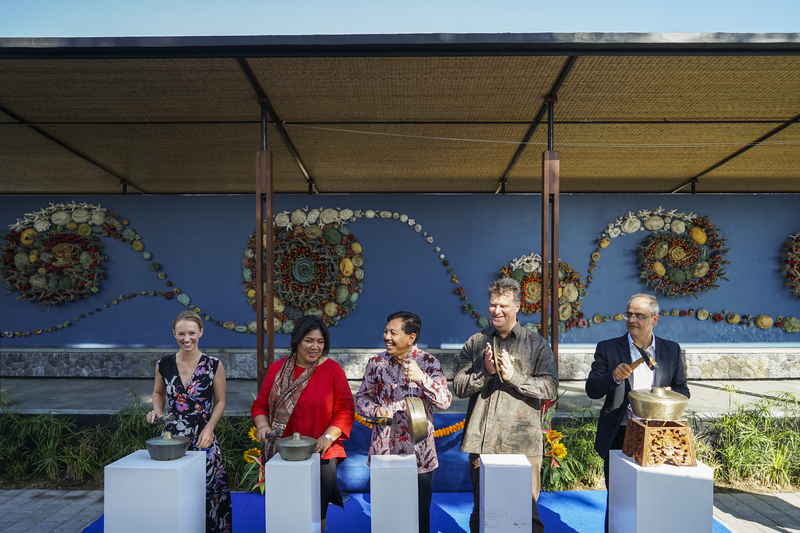 On the eve of the Our Ocean Conference in October the unveiling of the Coral Universe at the CTC Center for Marine Conservation in Sanur, Bali took place. 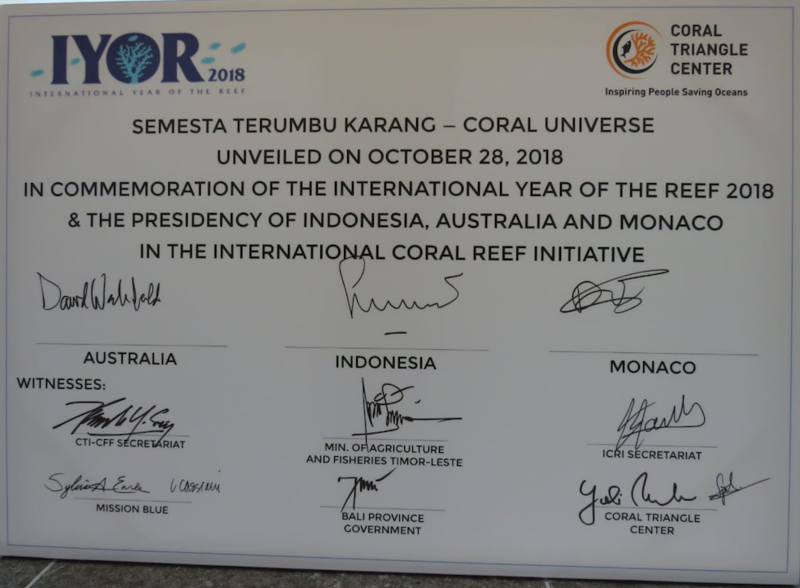 The unveiling was done so as to commemorate not only the International Year of the Reef 2018 (IYOR) but the presidency of Indonesia, Monaco and Australia in the International Coral Reef Initiative (ICRI). In attendance were the Minister of Agriculture and Fisheries Timor-Leste, representatives from the Ministry of Marine Affairs and Fisheries Indonesia, the principality of Monaco, the Government of Australia, Coral Triangle Initiative on Coral Reefs, Fisheries and Food Security (CTI-CFF) Regional Secretariat, representatives from various international and local marine conservation organizations, together with partners, artists, conservationists, and volunteers who made the ceramic coral pieces for the ‘Coral Universe’. Semesta Terumbu Karang—Coral Universe was commissioned by the Coral Triangle Center (CTC) to inspire people to appreciate the beauty, value and fragility of coral reefs and act to support coral reef conservation. This work was built in collaboration with Jenggala, Balai Teknologi Industri Kreatif Keramik (BPPT-BTIKK), and local artisans and more than 300 volunteers. “We really wanted to make an artwork that would inspire people from all walks of life professionals, tourists, school children also visitors from all over the world. We hope people see everything in there that will inspire them to take action. That they can see that the coral reefs are full of color and intricately linked with all that is living underwater. So the more you look into the coral reefs, the more you see things. And that is exactly what you see when you go diving. Especially for people who are not in a position to dive we hope that they can also be inspired by this artwork. The partnership is really unique as well. We wanted to involve the government as well as the private sector and the community,” said Rili Djohani, CTC Executive Director. The design highlights the connectivity and important roles played by the Coral Triangle countries in protecting reefs in an area considered the “bullseye” of marine biodiversity. While covering only 1.5% of the planet’s oceanic area, the Coral Triangle is home to 76% (603) of the world’s coral species and is the habitat of 37% (2,228) of the world’s reef fish species. 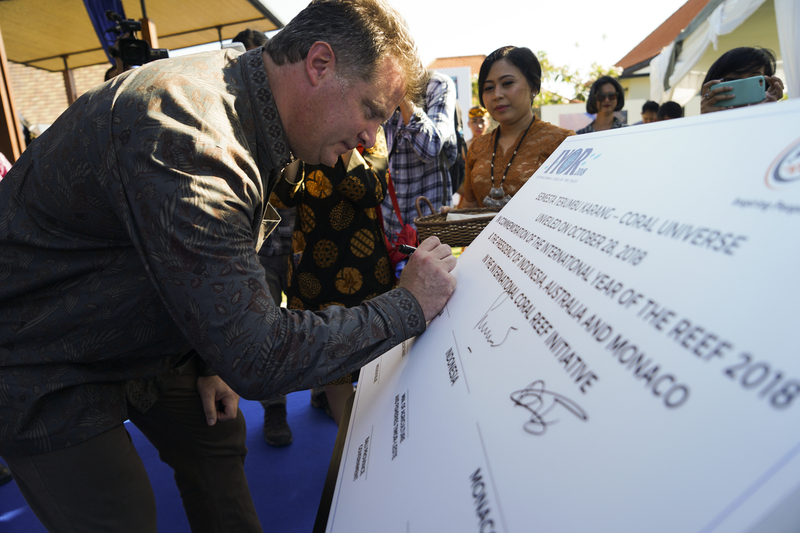 During the unveiling ceremony, a commemorative plaque was signed by representatives from the three ICRI presidents namely: Dr.Suseno Sukoyono representing Indonesia, Dr. David Wachenfield, Chief Scientist of the Great Barrier Marine Park Authority representing Australia, and Mr. Wilfrid Deri from the Ministry of Foreign Affairs of the Principality of Monaco. Mr. Wilfrid Deri from the Ministry of Foreign Affairs of the Principality of Monaco. The plaque was also signed by witnesses Joaquim Jose Gusmao Dos Reis Martin, Minister of Agriculture and Fisheries Democratic Republic of Timor-Leste; Sylvia Earle, President and Chairman of Mission Blue with Laura Cassiani, Executive Director Mission Blue; Francis Staub, Coordinator of the ICRI; Hendray Siry, Interim Executive Director of the CTI-CFF Regional Secretariat; I Made Gunaja, Head of the Marine and Fisheries Department of Bali Province; and Yuli Ismartono, Indonesian journalist and CTC Board Member with Rili Djohani, Executive Director Coral Triangle Center. 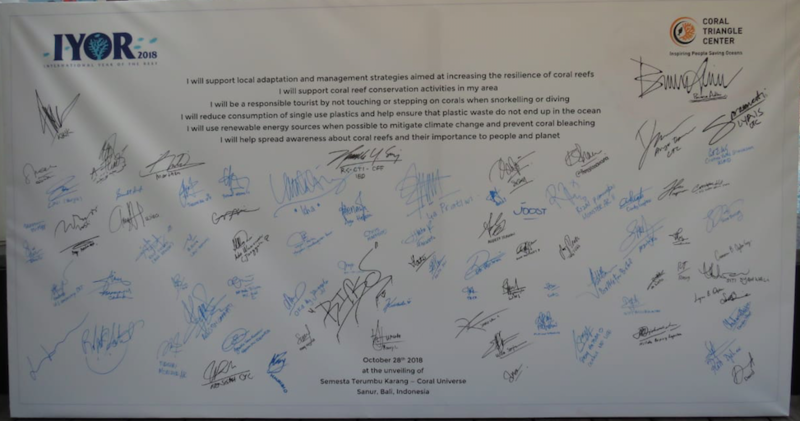 Meanwhile, other guests signed a pledge with six “Reef Resolutions” to protect coral reefs and raise awareness about its importance to people and planet. Reef Resolutions board with signatures. 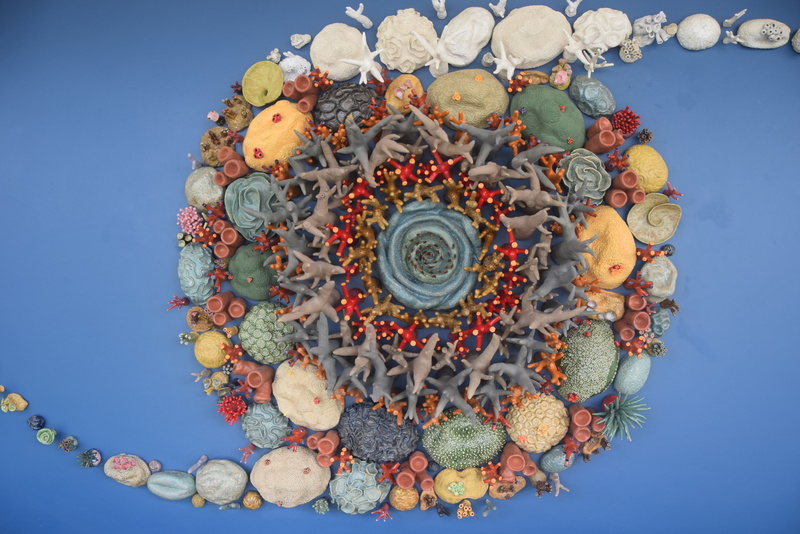 Along with the Coral Universe installation, CTC also introduces an augmented reality application that allows viewers to interact with the installation. This application offers a first glimpse into the use of advanced technologies in store for future exhibitions at CTC’s Center for Marine Conservation that will be used as tools to engage, inspire and educate future generations in the conservation of coral reefs and the oceans. Visitors can now use their smartphones to scan the installation and they will discover a coral reef environment in a 360-degree video Virtual Reality setting, before playing Encounter on the Reef a digital game where they will experience what it is like to swim amongst the marine animals living in the coral reef. Visitors will learn about the coral reef and why it is important to protect the reef and the oceans. “The Center aims to have 100,000 people visiting in person every year and also online. We expect to reach out to a lot of people in the Coral Triangle region and beyond. So by 2020, we hope to reach 1.5 million people. This artwork is a centerpiece in this awareness and education campaign in this International Year of the Reef and also going forward. I hope that when people see this artwork, they will ask questions. What is a coral reef? How come it is so colorful? Why is it so diverse? What are the functions of the reef so they start to realize how fragile it is and how important it is for us to preserve,” said Rili Djohani. 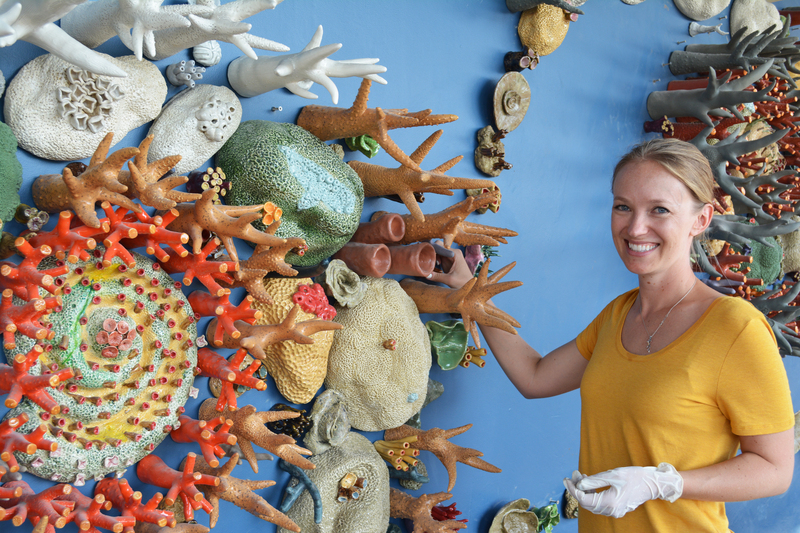 A combination of ceramic artworks, ocean and conservation science and augmented reality is the innovative way CTC will educate people about marine conservation.